Seasonably strong upper wind profile and corridor of impressive SRH up to 600 (HRRR 00Z) brings a risk of tornadoes to Dixie Alley this evening, some strong ones too with a 15% tor. These early Dixie events can be high-end so this will be on my list to monitor. SPC AC 231243 Day 1 Convective Outlook NWS Storm Prediction Center Norman OK 0643 AM CST Sat Feb 23 2019 Valid 231300Z - 241200Z ...THERE IS A MODERATE RISK OF SEVERE THUNDERSTORMS THIS AFTERNOON/EVENING FOR NORTHERN MS...NORTHWESTERN AL...AND SOUTHERN PARTS OF WESTERN AND MIDDLE TN... ...SUMMARY... A few strong tornadoes, as well as damaging winds and isolated large hail, will be possible this afternoon and evening primarily across parts of Mississippi, Alabama, and Tennessee. 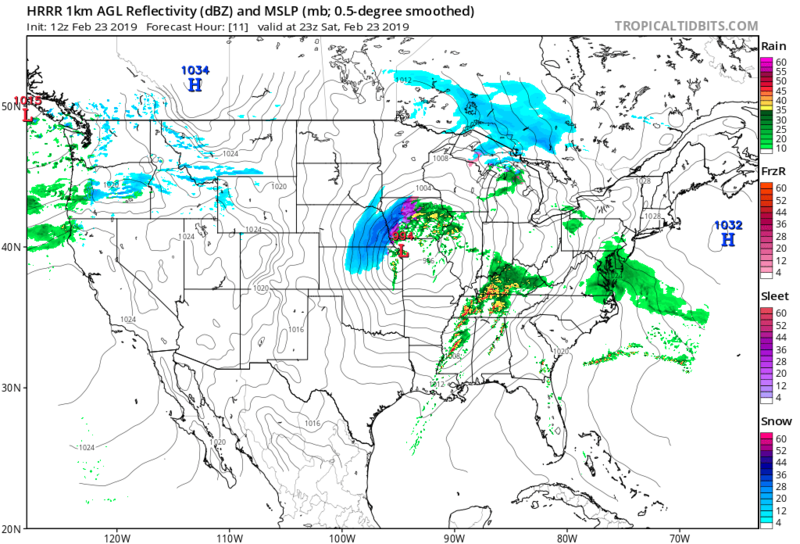 ...MS/AL/TN area today into early tonight... A surface cyclone across the northern TX Panhandle will translate quickly northeastward to the mid MS Valley by this evening and the upper Great Lakes overnight. The cyclone will deepen rapidly in conjunction with an ejecting midlevel shortwave trough and the left-exit region of a strengthening (100+ kt) mid-upper jet streak. 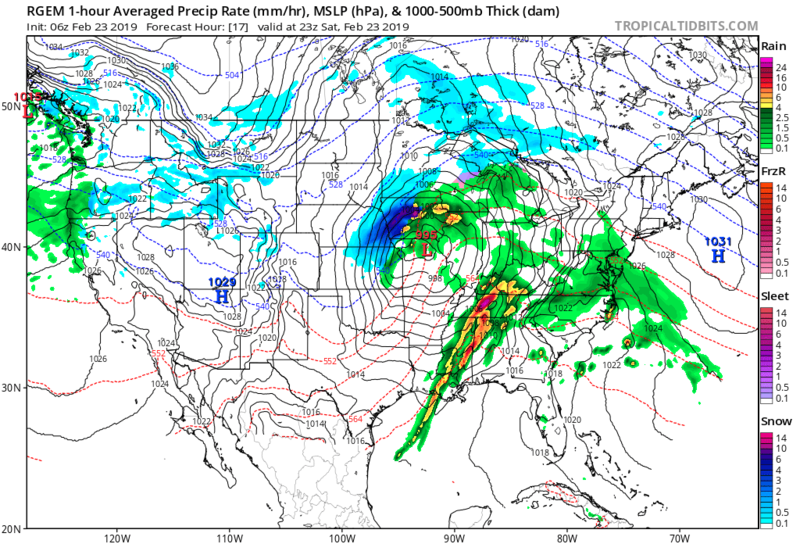 The deepening cyclone will draw the moist warm sector northward from LA/MS/AL this morning to the TN Valley later this afternoon/evening to the east of a weak cold front/pseudo-dryline, as a 50-60 kt low-level jet develops within the northern part of the warm sector. Marginally severe hail could occur with the stronger elevated storms across the mid MS Valley, but the primary severe threat is expected farther to the south in the surface warm sector. Convection will increase in coverage/intensity beginning this morning across east TX as large-scale ascent encounters the west edge of the moist sector, and storms will subsequently spread northeastward to the Ark-La-Miss and Mid South through early afternoon. Isolated large hail will be the main threat with the storms this morning. Farther east, surface heating in cloud breaks will result in destabilization within the open warm sector across MS by early afternoon. Surface temperatures in the mid-upper 70s with boundary-layer dewpoints of 68-70 F will support afternoon MLCAPE of 1000-1500 J/kg, with only weak convective inhibition. Semi-discrete storms are expected within the lingering band of morning convection, and in the open warm sector, given strong deep-layer shear and substantial cross-boundary shear vectors. The tornado threat will be greatest from about 20-03z from central/northern MS into western/northern AL and southern middle TN. Strong tornadoes will be possible given 0-1 km/effective SRH of 300-500 m2/s2 and effective bulk shear near 60 kt in a moist environment. Thereafter, storms should weaken by 03-06z, though isolated tornado/damaging wind potential could persist a little longer into northeast AL/northwest GA where storms will encounter a remnant wedge front. southwest Tennessee between about 3 to 7 PM. miles northwest of Jackson TN. Some nice structure and good CG bolts on the Jackson, MS cell (seen on Brad Arnold's stream). 4 W LEEDY ALCORN MS BRIEF TORNADO ALONG COUNTY ROAD 343. REPORT OF DOWNED TREES AND DEBRIS BEING LOFTED. 3 WNW BURNSVILLE ALCORN MS REPORT OF TORNADO TOUCHDOWN ON HWY 72 ON THE TISHOMINGO AND ALCORN COUNTY LINE. 1 SSW ARTESIA LOWNDES MS TRAINED SPOTTER HAD VISUAL CONFIRMATION OF A TORNADO CROSSING ALT HWY 45. DEBRIS NOTED IN THE AREA WITH DAMAGE TO A METAL SHED AND TRAILER. COLUMBUS LOWNDES MS TORNADO REPORTED IN DOWNTOWN COLUMBUS WITH DEBRIS NOTED ON RADAR. 3 ESE HIGHTOGY LAMAR AL NUMEROUS TREES DOWN IN THE KINGVILLE AREA ALONG AND NEAR HIGHWAY 20. DAMAGE LIKELY DUE TO A TORNADO.